Be sure to subscribe to our Youtube Channel! We’ll be releasing new videos every Friday! A Winter Solstice Farmer’s Market Feast! 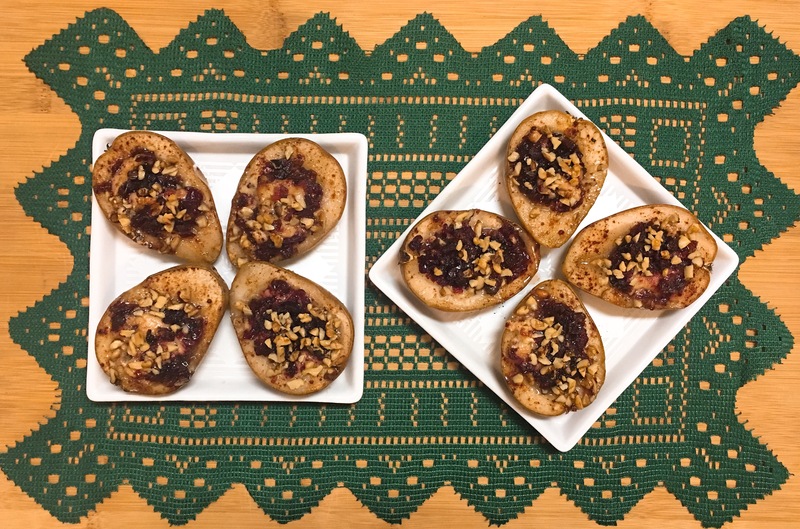 I am thrilled to be sharing my seasonal Farmer’s Market Feast today and how perfect that it just so happens to line up with the winter solstice! A Farmer’s Market Feast lasts all week-long in my house because all of my food is from the past Sunday’s, Mar Vista Farmer’s Market. 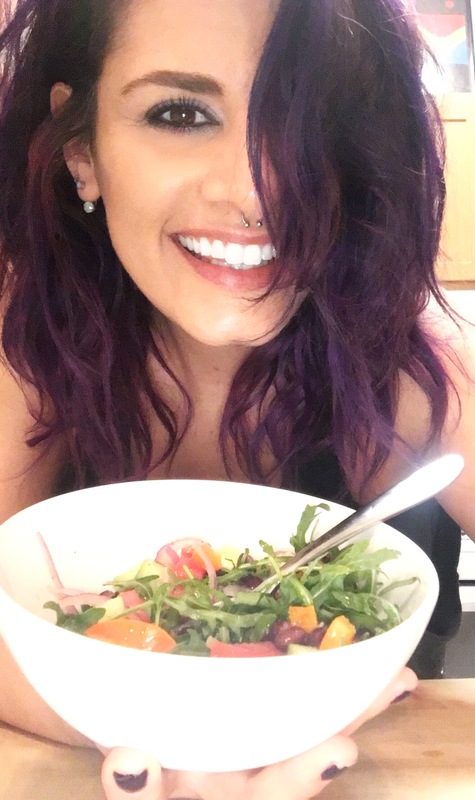 Majority of everything I eat is my own home cooking, and honestly, I wouldn’t have it any other way! Being raised with high values around food and cooking, I don’t let my busy lifestyle get in the way of cooking an excellent meal. 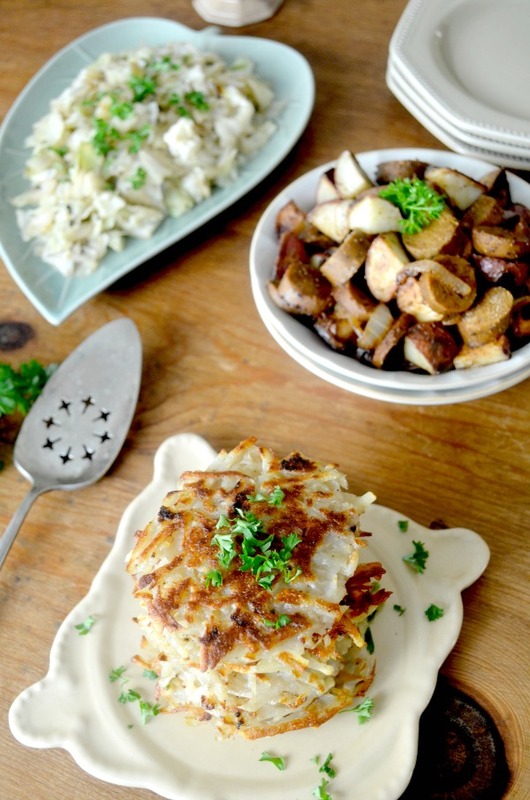 My hope is that once you read my simple menus, you will be motivated to grab a few staple ingredients and make it a habit to cook up some versatile, affordable and downright delicious meals for the entire week. The farmer’s market is lit up with beautifully bright orange, red and purple foods. 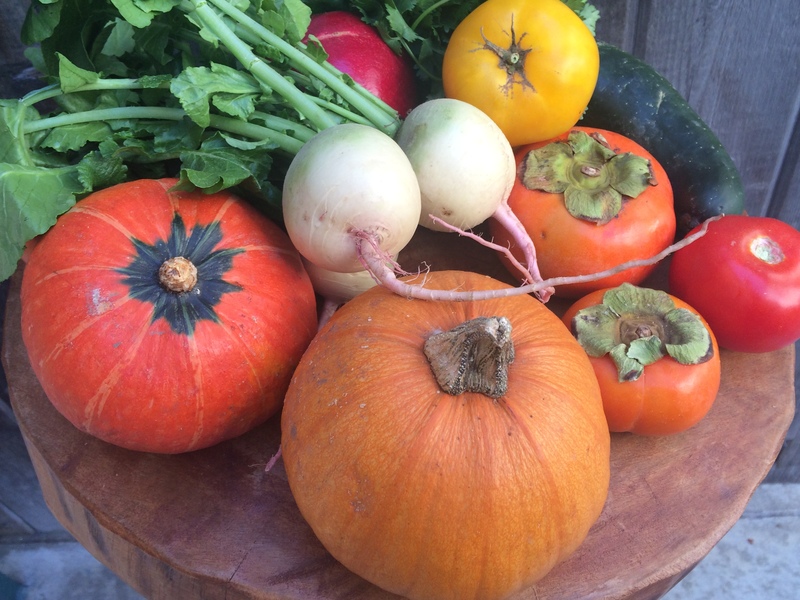 Thanks to nature’s perfect timing, these carotenoid-rich foods appear in winter to nourish and heal our skin and eyes after long days in the summer sun. 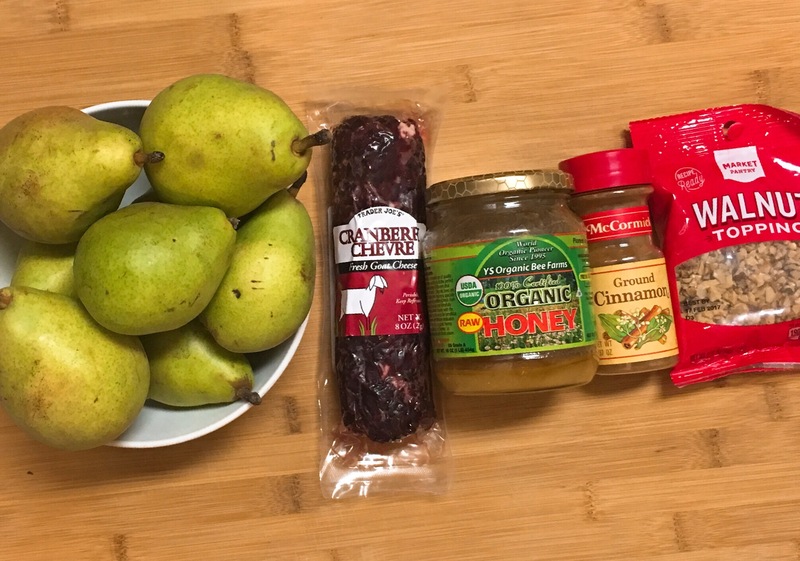 Below are a few of my favorite winter foods and how I enjoy them in all their glory. 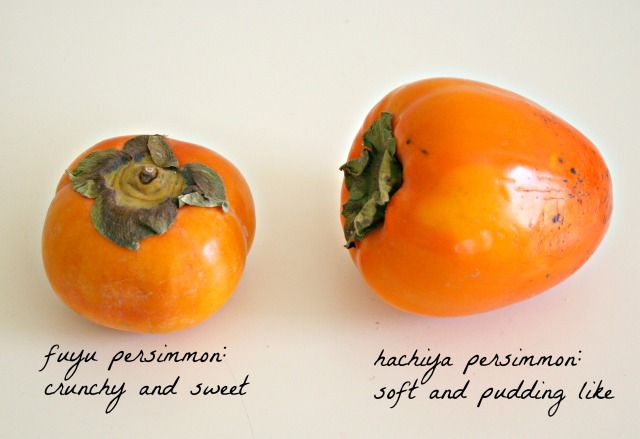 Persimmons: The markets are overflowing with Fuyu and Hachiya persimmons but their season is almost up so get on them soon! 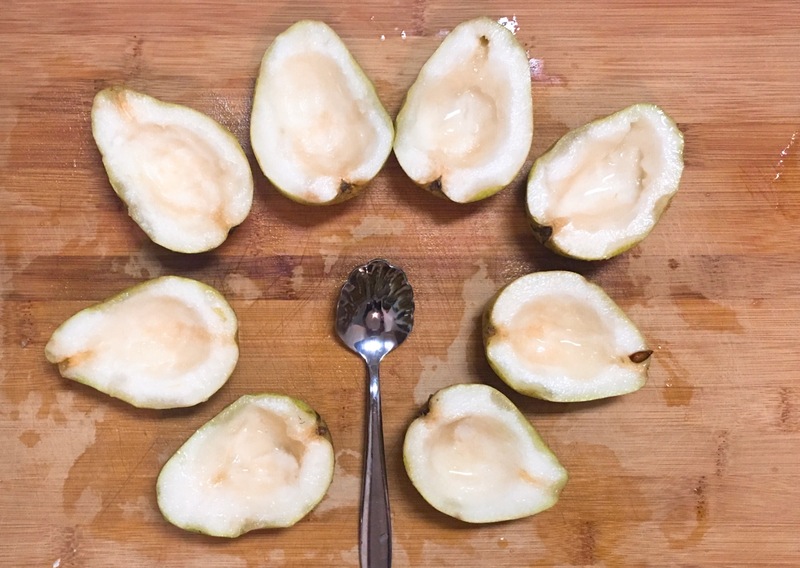 Fufu persimmons can be eaten raw when they are as hard as an apple, but a Hachiya is best when it’s so soft and overripe it practically collapses in your hand. My favorite ways to eat persimmons are to either make a salad with pomegranate, dill, parsley, chives, shallots, basil and mint with fresh squeezed lime and olive oil or bake them with aromatics like cinnamon, vanilla, star anise and cardamom. When cooked long and slow they develop a flavor of what you would imagine an Indian sweet potato pudding to taste like! There’s nothing like it! TRY THIS: Cut 4-6 Fuyu persimmons (ask a farmer at the market to help you pick good ones if you’re unsure) into thin half-moon shapes (skin on or off) and place in a greased (with at least 2 tablespoons of coconut oil) heavy roasting pan. Pour in two cans organic coconut milk, 1/2 cup water, a teaspoon of cinnamon extract, a teaspoon of vanilla extract, another heaping tablespoon of coconut oil and one teaspoon of butter (vegans can skip). Roast covered at 375 for easily 45 minutes or until desired consistency. Keep checking in between to baste them with the aromatic liquid. Let cool. You can use to top biscuits with fresh whipped cream for a persimmon shortcake. 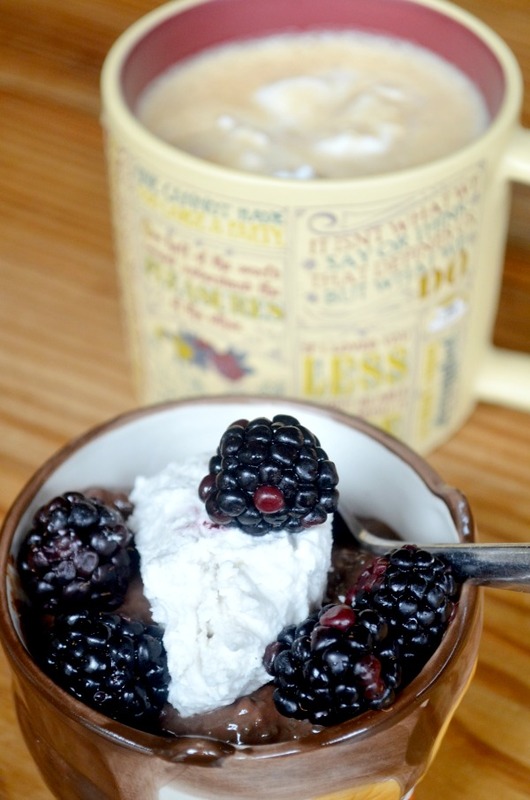 You can mix with bread and cream for bread pudding. You can also boost your yogurt or porridge with roasted persimmons. I’ve even tried them in a savory stuffing served with lamb, beef or fatty chicken thighs. Cooking savory dishes in the winter implies a lot of roasting, braising or making soups, so I always have homemade veggie stock on hand. TRY THIS: If you eat lots of veggies like I do, then making your own veggie stock should be an easy task because you will have all your veggie end cuts, onion, garlic skins and fresh herbs on hand for your base. From there, all you need is water, a bay leaf or two, peppercorns, salt and a couple of carrots and onion or leek for depth and sweetness. I like to add a little tamari (a thicker, less salty, fermented soy sauce that contains less wheat) or Braag’s Liquid Amino’s. Once everything is in the pot, bring to a soft simmer for 20 minutes, cover and take off the heat. Let cool outside of fridge overnight and then pour in glass jars for up to a week. You can also freeze your stock. NOTE: Don’t ever use eggplant or potato end-cuts to make stock. 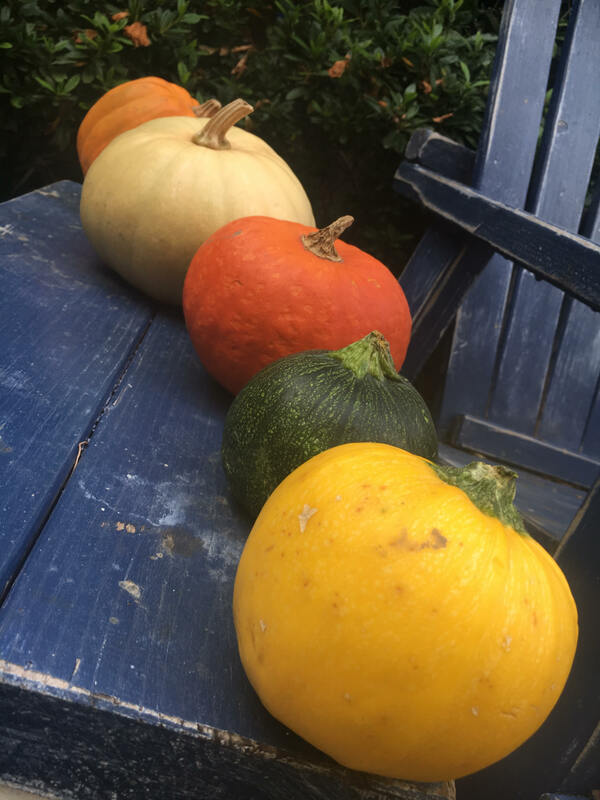 Squash Pumpkin, Acorn, Kabocha, Butternut, Speckled Hound the varieties are endless. 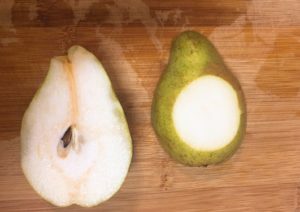 They are all easy to cook – roast, steam or sauté and they all taste pretty similar. The differences I find with squash is the texture, Kabocha and Acorn are denser and hearty while others like butternut are wetter and mild in flavor. 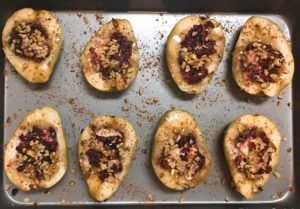 Personally, I tend to lean toward the hearty squashes, but you find yours! Squash tastes great with olive oil, salt, lemon, onion, and garlic. 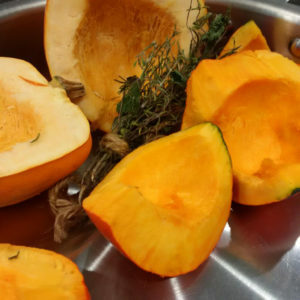 You should feel free to incorporate herbs like rosemary and sage to your heartier squashes and having caramelized onions and browned garlic for topping your squash veggie bowl. Also, try aromatics like cinnamon and curry when cooking your lighter squash. No matter what you do, squash is a no-brainer: Clean it, cut it in half, rub it down with olive oil and salt and your spices and put it in a 350 oven covered for 35 minutes. Greens like collards, kale, turnip, mustard, and dandelion are everywhere this season. I like to cook them long and slow with just lemon juice, plum vinegar, sesame oil, salt, chilis, and garlic. I mix them all up, adding the heartier greens like kale and collards first because they take longer to cook. 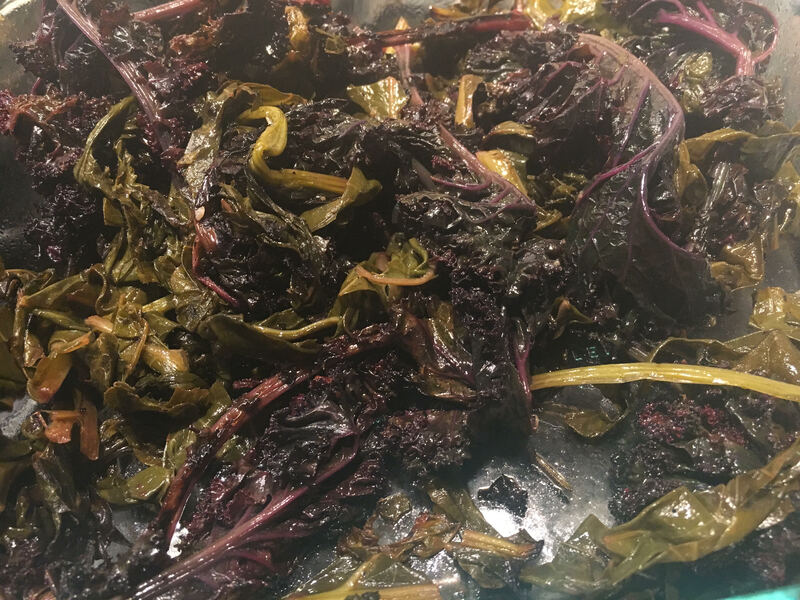 You can add bacon for flavor (which some people love to do) but I prefer mine without because then I taste how delicious the actual greens are! One of my go-to bowls that I make is roasted squash topped with lots of greens, then drizzled with olive oil and a dash of tamari. Leftovers? Serve greens with two over-easy eggs and a buttered toasted English muffin. 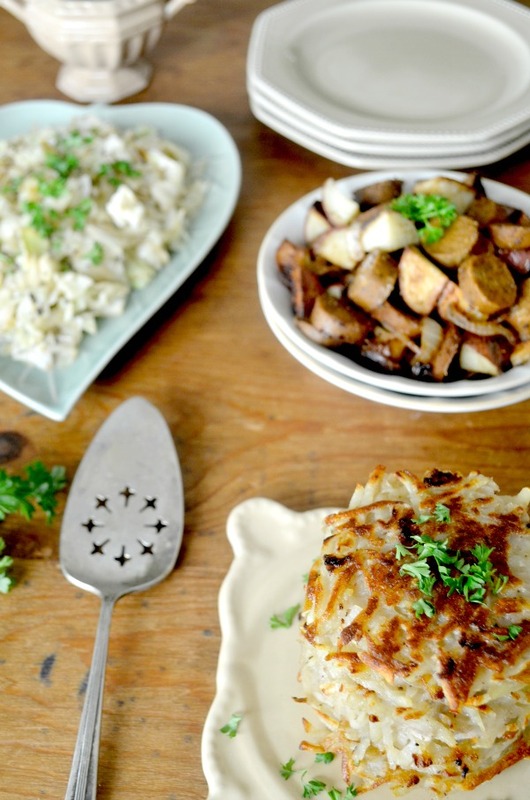 I hope my ideas inspire you to get cooking with farm fresh ingredients. My brand Farmer’s Market Groupie is in a pre-launch period. Stay tuned for our website in January 2017 and if you are in Los Angeles, always feel free to reach out for a farmer’s market tour via my Instagram page – @FMGroupie. 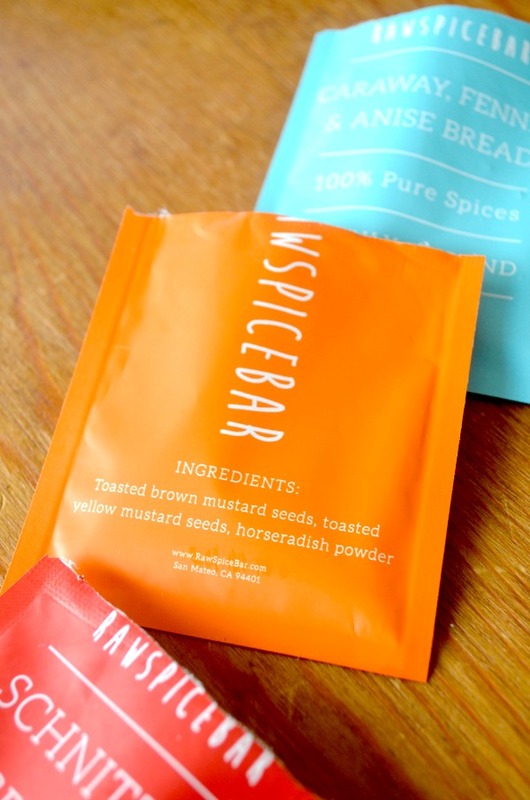 Enter RawSpiceBar, a company that uses high quality ingredients and careful techniques to deliver a unique trio of global spices straight to your door each month. For me personally, trying RawSpiceBar allowed me to get out of my spice rut and think outside the box. I tend to stick with the same handful of spices for all of my cooking and baking. But this reminded me that spices are vibrant, full of personality and can motivate creativity! Rose & Cinnamon Advieh, Mango Toasted Chaat, Pimento Bloody Mary, Dark Coffee & Chiles, Achiote Recado Rojo, Turmeric Japanese Curry and more! As a gluten free vegan (I know, I know) I’m able to take any of these flavor kits and make something unique and delicious in line with my food lifestyle. 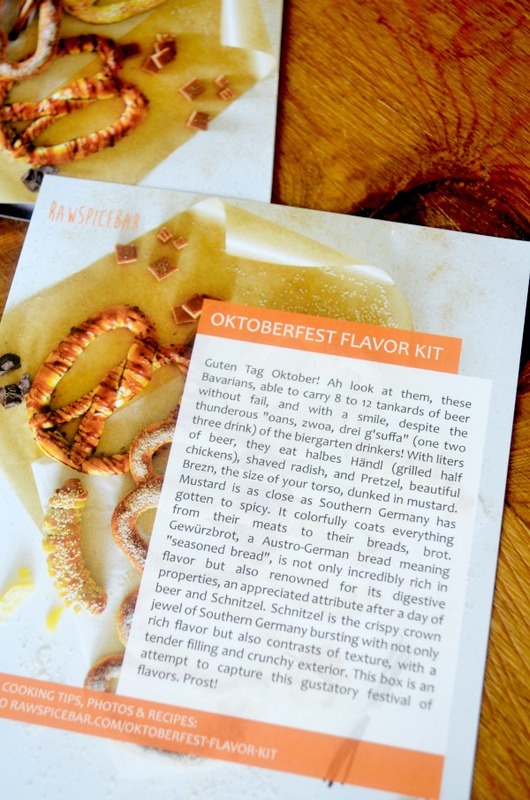 With the Oktoberfest flavor kit, I knew I was in for some savory German-inspired dishes! 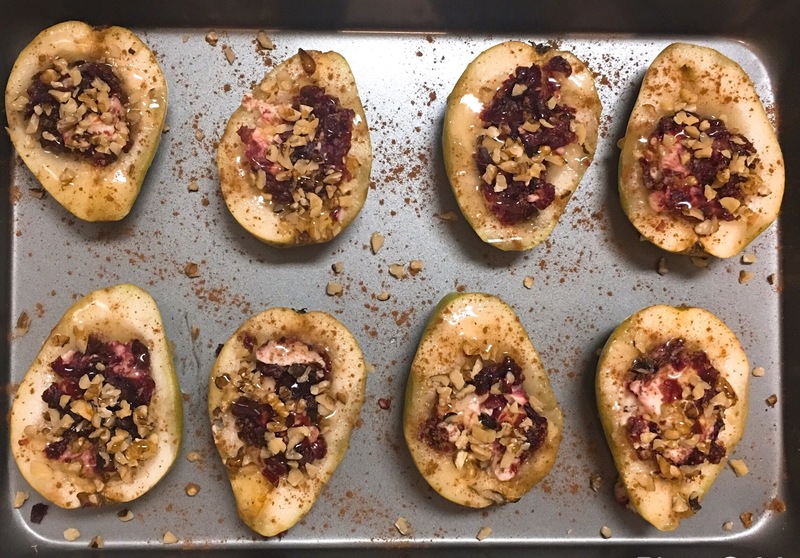 Here are three easy recipes for your culinary enjoyment: one from RawSpiceBar, one I adapted from another food blogger and one of my own creation – all using my flavor kit containing three different spice blends. Guten Appetit! My flavor kit came with a recipe to accompany each spice blend. 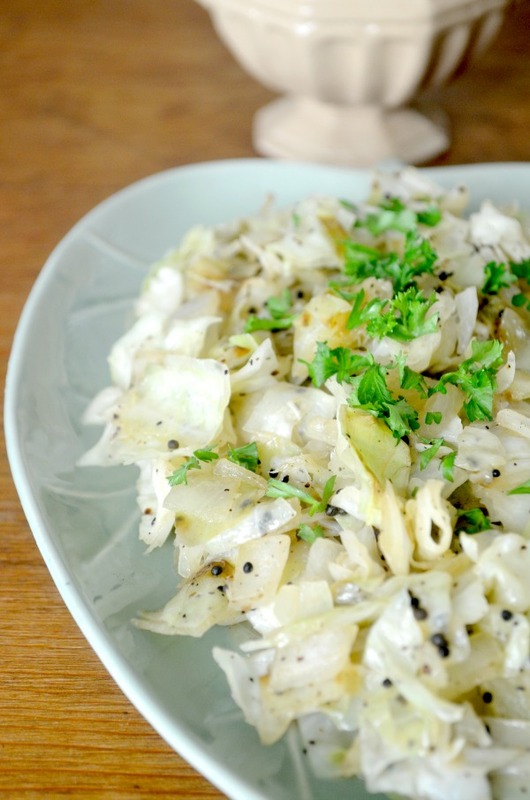 I was really excited to try this one because I love cabbage more than your average person and even though the recipe wasn’t vegan, I could tell it was going to be super easy to modify. I’m also a pretty big fan of both horseradish and mustard and the combo of the two. I recommend this as a side dish to the main course. Heat a large pan over high heat for 2-3 minutes. Add vegetable oil (I used extra virgin olive oil) and make sure it’s shimmering, then sprinkle RawSpiceBar’s Horseradish & Mustard Seeds across the surface and cover immediately, cook until seeds stop popping, about 1 minute. 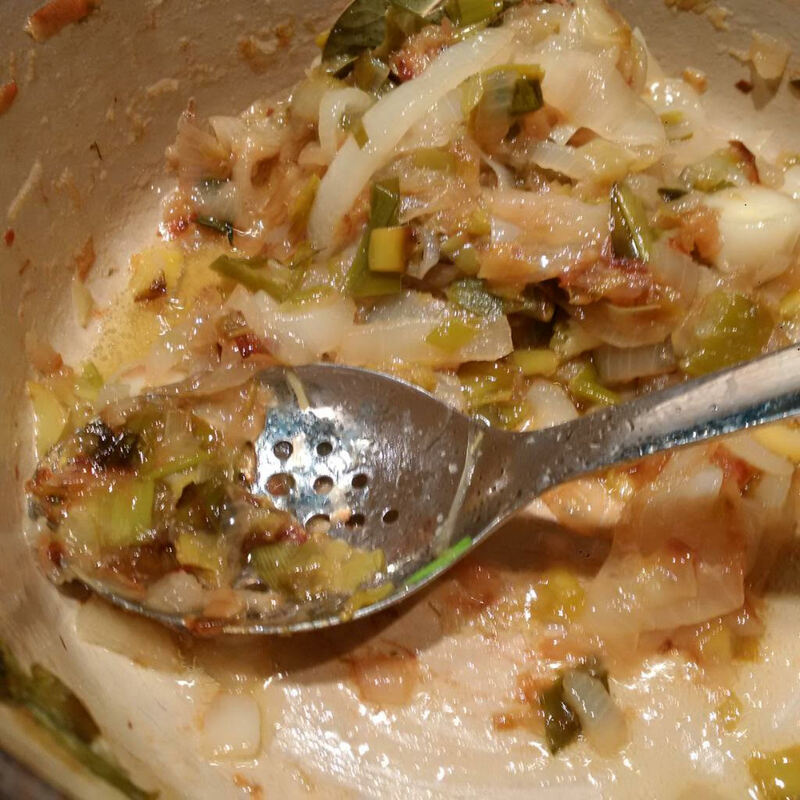 Remove the cover, turn heat to medium and add diced cabbage and onion. Add vegan butter and salt and toss to combine, stirring until vegetables begin to wilt, about 4-5 minutes. Turn heat down to medium-low and cover. Cook for 10-12 minutes, until the cabbage is tender. Remove from heat. Serve hot or at room temperature. Store extra in a sealed container in fridge. Notes: I hope you like cabbage as much as I do, because you will have a ton it! I halved this recipe and even that was a lot. This dish was so much more flavorful and rich than I expected, and even tastes good cold. Promise! This recipe makes me very happy for two reasons. 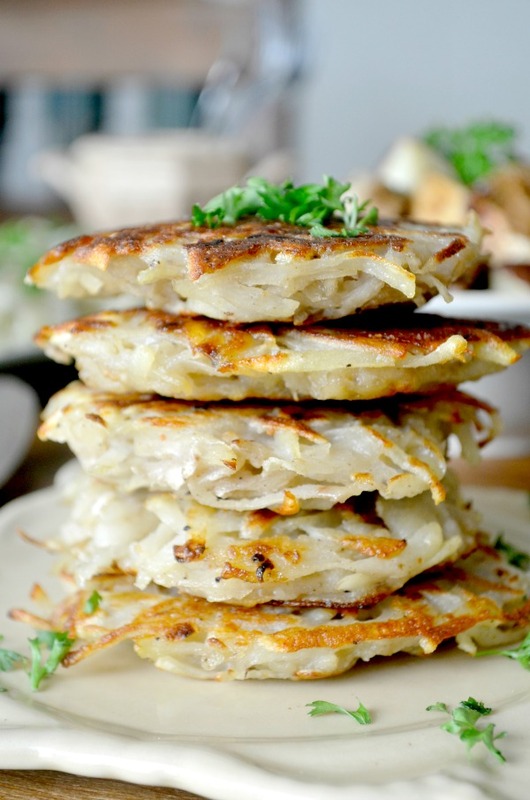 One, it reminds me of making latkes with my family every year for Hanukkah. And two, I love potatoes to the point where I feel an intervention might be necessary. Really. I modified this recipe from It Doesn’t Taste Like Chicken to suit my own tastes as well as to be gluten free. It can be a main or side dish, breakfast, a snack – whatever you like! Add all ingredients except the oil to a large bowl and mix well. Pour 1 tbsp oil to large skillet on medium heat. Take a handful of potato mixture and form into a patty. Fry for a couple minutes on each side or until golden brown. Drain patties on a paper towel. Store extras in airtight container in fridge. Notes: Makes about 12-15 pancakes. These babies taste great served with applesauce or sour cream. I make my own sauce by mixing vegan mayo with some lemon juice and nutritional yeast. Sounds weird but it’s delicious! The schnitzel spices add the perfect amount of kick to what would otherwise be very basic potatoes. And who needs basic when you have RawSpiceBar? I may have saved the best for last, and I’m not saying that because it’s the recipe I created! 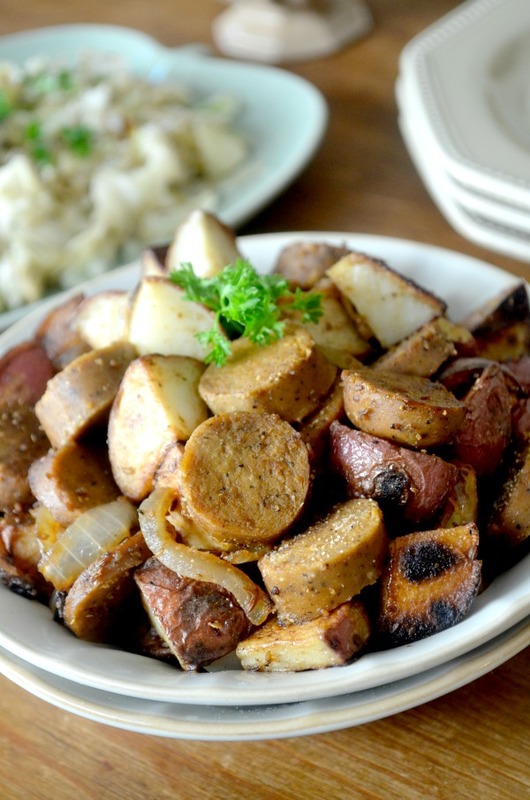 This was my favorite spice combo and it went perfectly with the kielbasa sausage, smoky potatoes and crispy onions. This recipe could be the main or side dish. It’s hearty and flavorful and super easy to whip up. Heat oil in a skillet on medium low. Saute the potatoes until fork tender, about 15 minutes or so. Cut the onion slices in half and add to skillet. One they begin to brown add the sausage, spices, salt and a little garlic powder. Cook another 5-10 minutes to let everything heat up together, adding water if the mixture gets dry. Notes: This dish is delicious on its own, thanks to the spices, but you can also serve it with your favorite sauce. The caraway, fennel and anise flavors really stand out but aren’t overwhelming and everything just tastes perfecto. Store leftovers in the fridge. The cool thing is, if you sign up for a 12 month subscription, it’s only $7 a month. I easily spend twice that on one visit to Starbucks (shaking my head in despair). And each flavor kit contains enough spices for recipes that feed up to twelve people. 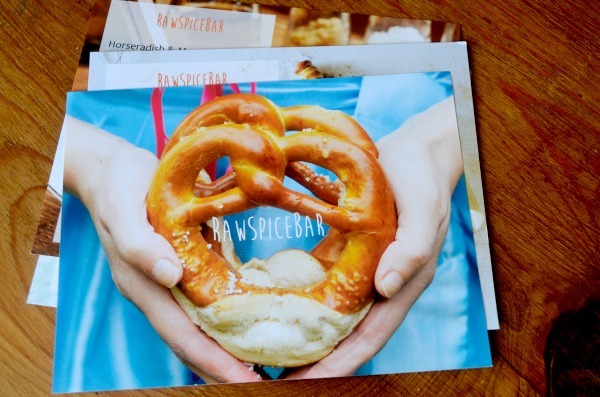 But the best part, from my point of view, is that each flavor kit will challenge your creativity and culinary skills in a fun way, and bring you spices from all over the world that you otherwise may never have tried. Head to RawSpiceBar.com to learn more. You can view the different subscription options or send a flavor kit as a gift to someone. And there’s tons of great recipes to sift through. The Curious Creamery started in Southeast Asia as a way to re-imagine the way of bringing and making ice cream in that part of the world. They saw how traditional ice cream making could be environmentally detrimental and they wanted to cut the carbon footprint, plus bringing healthy and delicious treats to the area. The revolutionary treat was brought to the US as a healthier/more in control dessert option for the consumers over here. I honestly love the idea of having a base to work with and then creating from there, and that’s what The Curious Creamery allows you to do. It gives you the options to create and make whatever delicious ice cream treat you could ever imagine, and you can decide how healthy or unhealthy you want it to be. Don’t want to use whole milk? That’s fine! Would prefer to use yogurt? That works too! Allergic to chocolate, but love cookie dough? Now you can make your own cookie dough without the chocolate chips. That’s the selling point for me right there! The other cool factor to The Curious Creamery, is you don’t need an ice cream maker. Let me repeat; you don’t need an ice cream maker! Just a handheld or stand alone mixer will do, plus some ice cold milk and you have the fixings for a delicious treat. Simplicity is also something I love. For someone who is always busy, the idea of creating a custom ice cream in a half hour of time going to my second job and coming home a few hours later to it enjoy sounds like heaven. So a few things to note. 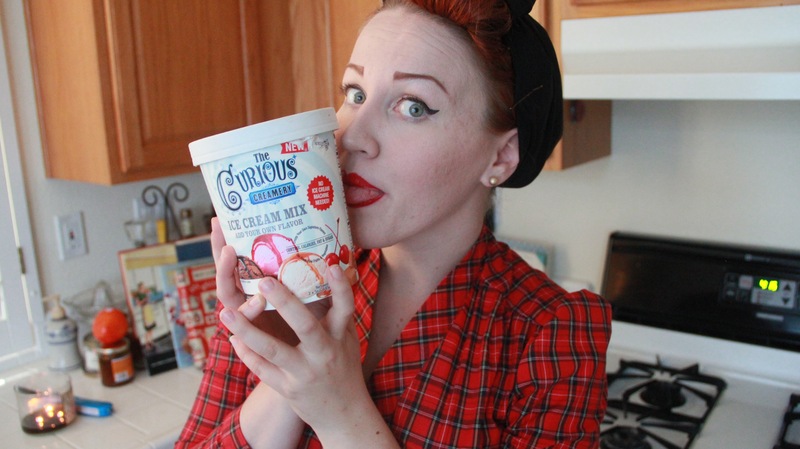 The Curious Creamery sells about three products. The first is an ice cream base in powder form. It comes in a tub with two packets from which you can enjoy up to 1/2 gallon of deliciousness of your choosing. Two packets allow you to make two different kinds of flavored ice cream. So you can get creative! The other two items are Vanilla Sweet Cream Ice Cream Cake Mix & German Chocolate Ice Cream Cake Mix. “The Curious Creamery Ice Cream Cake Mix contains no high fructose corn syrup, artificial colors or flavors, lactose, or preservatives; and is naturally trans-fat, cholesterol and gluten-free.” The Cake Mix does require a few more ingredients like whole milk, heavy cream and so on, but I love the fact that it last longer in its nonmelting form which makes it ideal for parties or so on. Take it from me, when making an ice cream cake you WANT to use their cake mix and not regular ice cream. I tried, and I got a pool of melted ice cream in seconds. Your welcome for the information! I would also like to point out that ice cream is perfect year round. 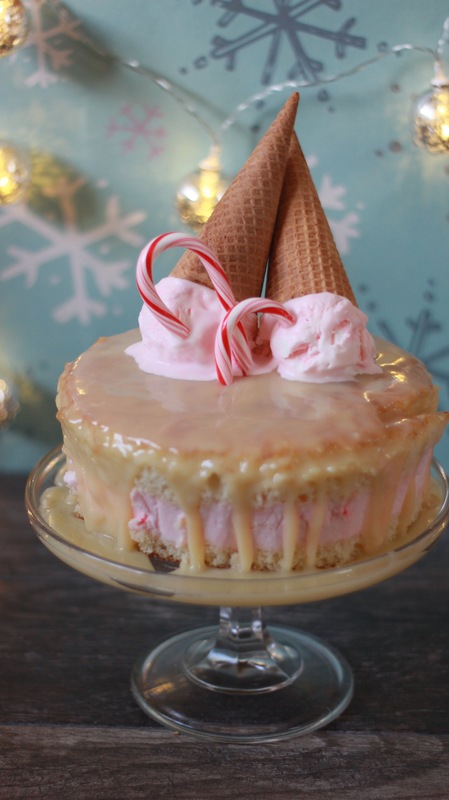 May not seem like a winter dessert option, but I am here to tell you that it is especially with my own personalized White Chocolate Peppermint Ice Cream Cake (used with The Curious Creamery Sweet Cream Ice Cream Cake Mix). If you’d like to try it, here’s the recipe! Make vanilla cake according to box instructions and let cool completely. While cake is cooling, crush candy canes (as this can be a long process that I was unprepared for). 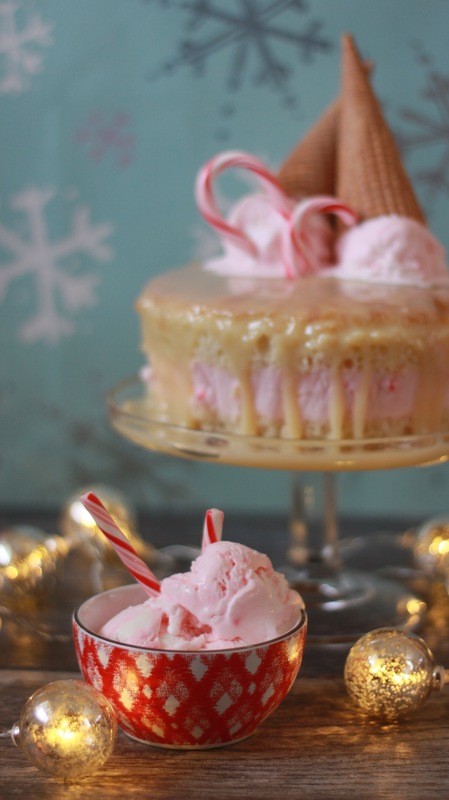 Follow instructions for The Curious Creamery’s Sweet Cream Ice Cream Cake and once to a creamy consistency add in flavorings, food coloring, and crushed candy canes. Cut cake in half (carefully). 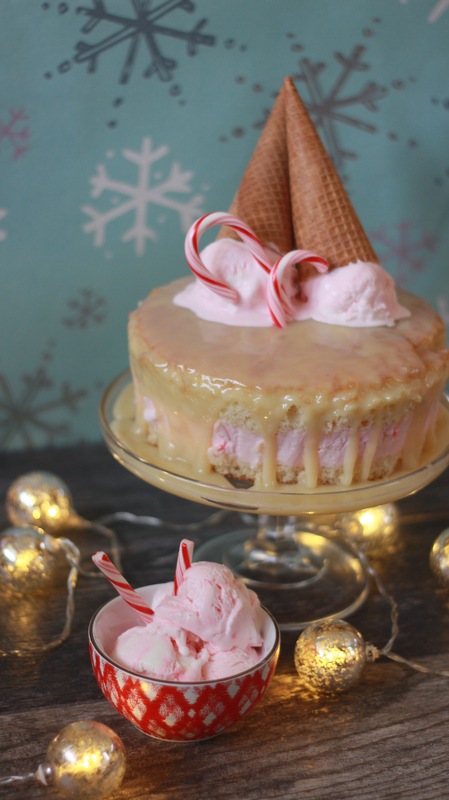 Keep the bottom of the cake in a cake pan and add a layer of the Peppermint Ice Cream mixture. Top with the other half of the cake mix. Add parchment paper and freeze for at least 4 hours or overnight. In a sauce pot over low heat add all ingredients together and slowly whisk. Let cool slightly. Once cake is ready, pour ganache over the top. I’m already having dreams and inspirations come to me for my next creation with The Curious Creamery, and I can’t wait to enjoy again! 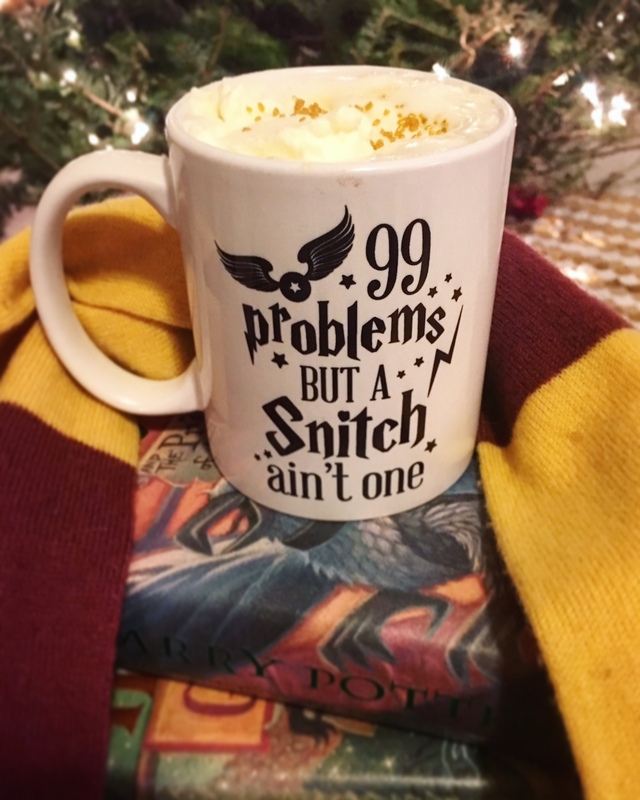 Say Yes to Busy Nights! 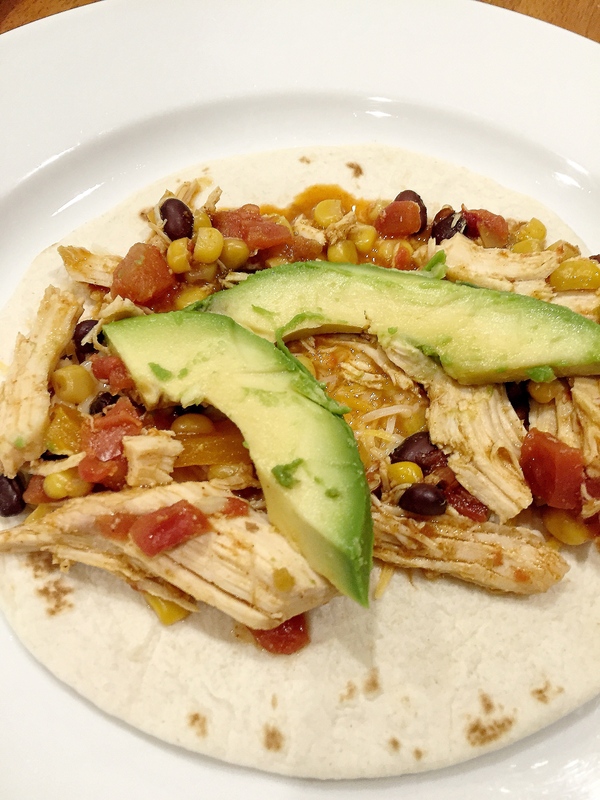 Crock-Pot Chicken Enchiladas to the Rescue! The first time I made these amazing chicken enchiladas was back in February, while covering for a co-worker on maternity leave, and coming right off a week long ski trip to my entire sales team in town! I was extra busy and needed to learn to lean on my Crock-Pot. I have always thought of Crock-Pot meals as 1. Heavy 2. Unhealthy 3. Fat 4. Hokey Midwestern (no offense). In the last 12 months, my opinion on this incredible kitchen appliance has completely shifted, especially after reading this inspiring Instant Pot Chicken Breast recipe. So after eight years of being used solely to make my specialty football season queso, we are now using our crockpot on a regular basis. 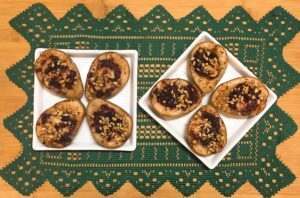 This recipe is the current favorite in our household. My 3-year-old was able to pour all the ingredients (except the chicken) into the Crock-Pot this morning. 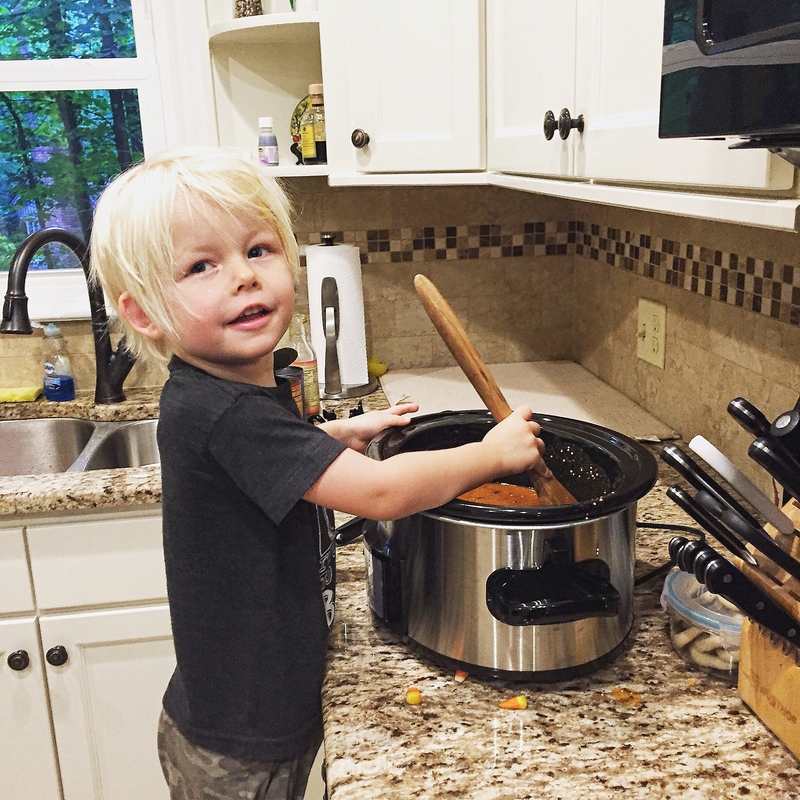 I’m all about empowering kids to cook, and he is so proud when I let him run the show! I ran to the market after work to buy Funfetti cake mix for my daughter’s smash cake this weekend and saw a stack of tostadas out of the corner of my eye. So tonight, we have fully branched out. 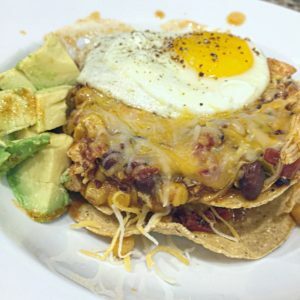 We made…Chicken Enchilada Huevos Rancheros. I mean. Oh. My. Gah. I had to try it. My husband was skeptical but went all in. We did two tostadas stacked (with just a little bit of the deliciousness in between, then more on top; then topped with a salt and peppered egg over easy, diced avocado, pickled jalapeno, and mexi-cheese. If you’re ever in a rush or need to bring dinner to a new momma, impress a girl, or feed a group, definitely give this a shot. In taco form or served up fancy, this meal has never let us down, and is always sure to impress! 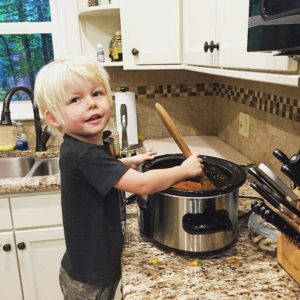 Can’t wait to find our next Crock-Pot favorite! toppings: mushrooms, olives, artichoke hearts, red onion, bell pepper, spinach, broccoli, etc. 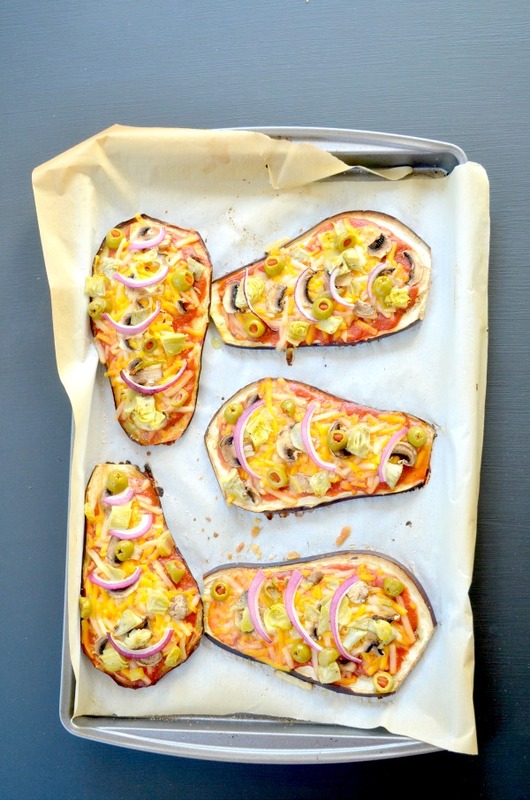 Cut your eggplant into approximately 1/4 inch slices. I got 5 slices from my eggplant. I left the skin on because it looks prettier, which made it a little chewy, but I didn’t mind. However, you can peel the skin off if you prefer. 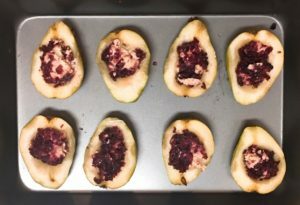 Lay your slices on a baking sheet lined with parchment paper. 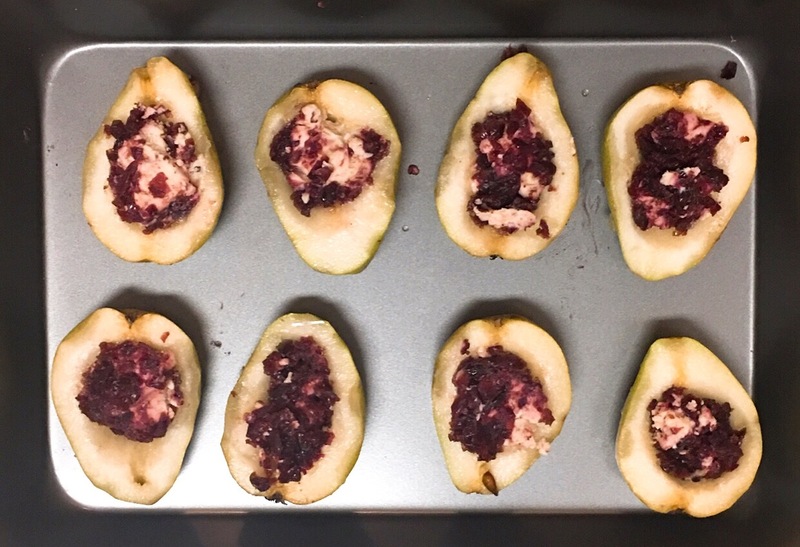 Sprinkle salt over the slices and let them sit for 20 minutes. This brings the extra moisture from the eggplant to the surface. Wipe the salt off and dab the excess salt with a paper towel. Drizzle olive oil over the slices and sprinkle some dried oregano. Bake in the oven for 25 minutes. 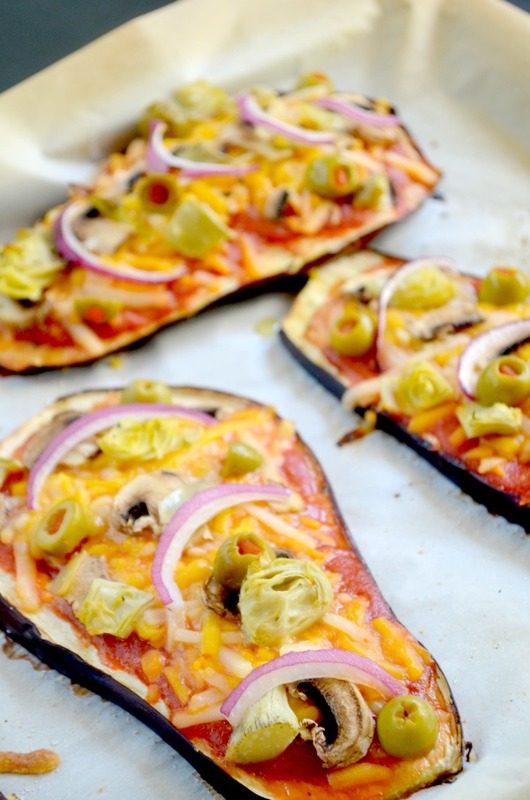 Spoon tomato sauce onto the eggplant slices. I used a small can of plain organic tomato sauce and mixed garlic powder, salt, dried oregano and a little nutritional yeast to it for added flavor. 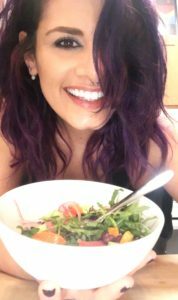 Add your vegan cheese shreds (homemade cashew cheese would also be yummy and less processed) and whatever toppings you like. Broil on low for about 10-15 minutes or until cheese is melted and your pizzas are starting to brown on top. Let cool for 5 minutes and enjoy! I’ve only made this recipe once, but we’re already in a committed relationship 💍 I know it will be my new go-to whenever I’m craving pizza. Regular vegan pizza doesn’t actually fill me up for very long, but eating this eggplant pizza for lunch left me so full that I didn’t eat dinner until 9 pm! This is a great meal for getting in all those veggies your body needs while also being freaking delicious. 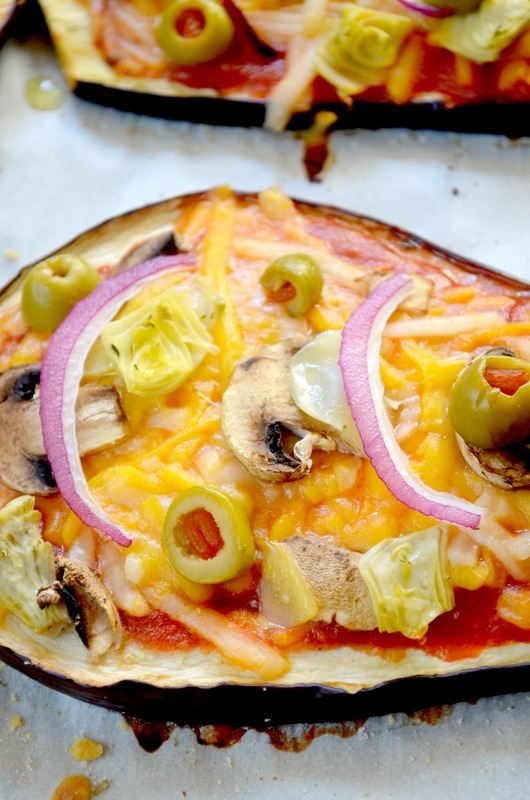 Well done, eggplant pizza, well done. These days, I rarely have time to sit down and read a book. Let’s be honest, I am lucky enough to keep up with meetings, conference calls and only because of The Skimm am I well aware of what’s going on in the news. When I found out that Andrew Tarlow was making a trip to Nashville and partnering with one of my favorite restaurants in town, Rolf and Daughters, I knew this was an event not to be missed. I put aside the magazines, hit pause on the DVR, sat down and read Dinner at the Long Table from cover to cover. It’s no surprise that this “cookbook” reads more like a personal journal or book of short essays exploring family traditions and celebrating those that have shared dinner at the long table with Tarlow from the beginning. Tarlow and Rolf and Daughters carefully selected dishes highlighting multiple menus throughout this gorgeous book. We started with Turnip and Apple, which was a slight variation of the Turnips and Oranges recipe under One Good Goose. 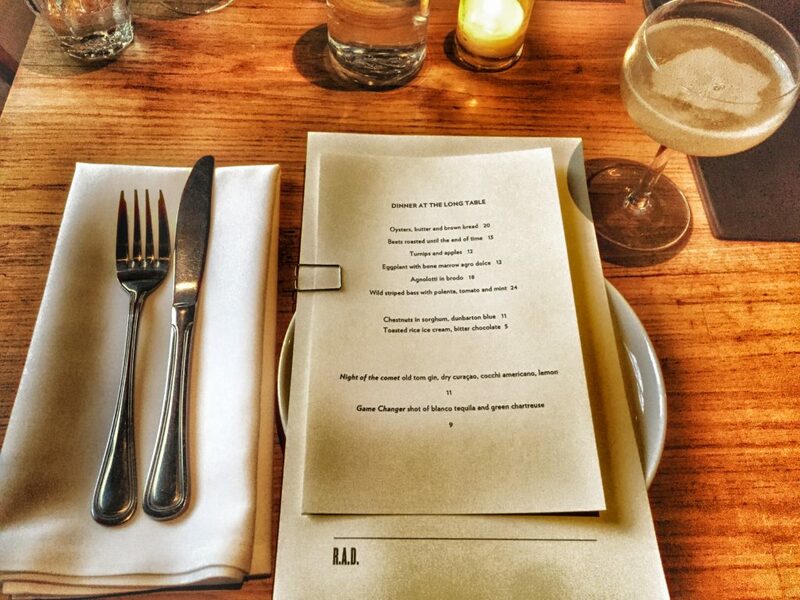 This menu focuses on the importance of people and procuring ingredients from local purveyors. The apples were the perfect juxtaposition to the turnips. 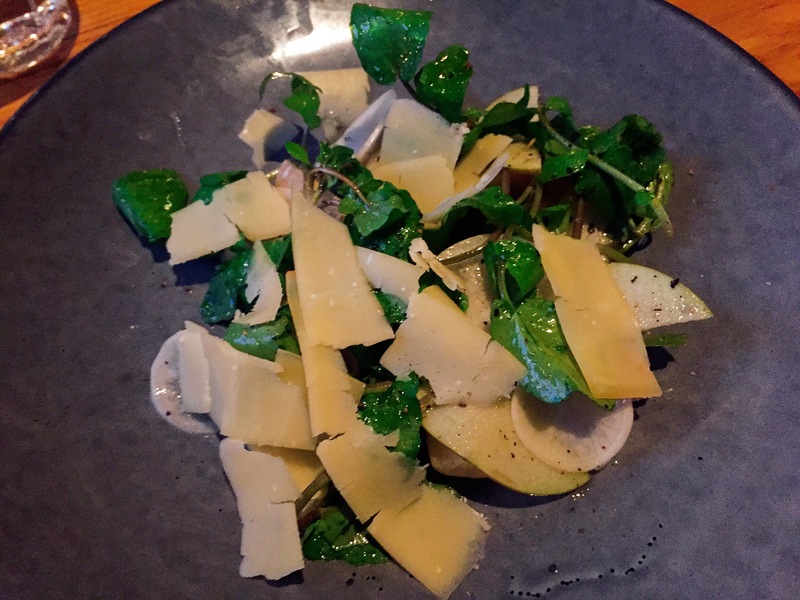 The heartiness of the dish was balanced out with local watercress and Gruyere cheese. A perfect opener for the evening. 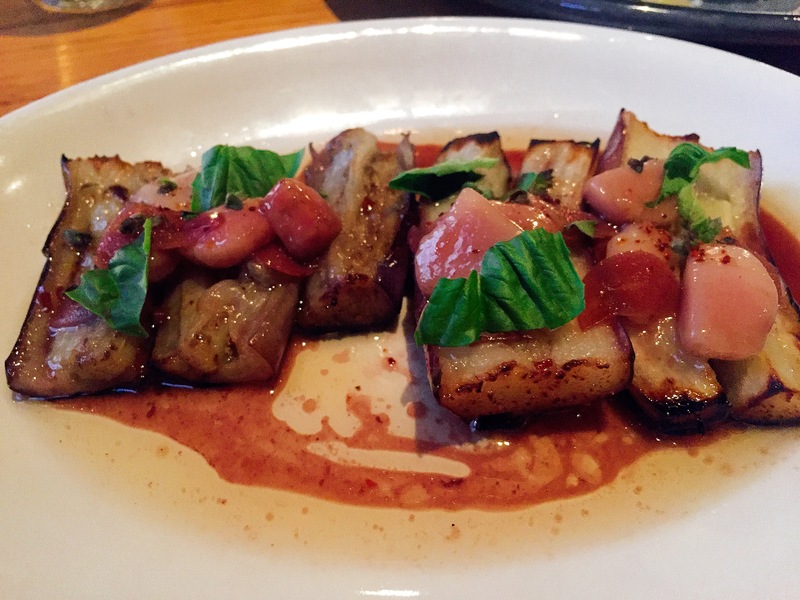 Anxiously awaiting our next dish, the Eggplant with Bone Marrow Agro Dolce was served from the section I love, you love, we all love bluefish. This menu pays tribute to those who enjoy and find pleasure in highlighting the unsung heroes of the sea. Speechless. I was left speechless after my first bite. This dish was the epitome of agrodolce. The richness of the broth provided balance to the sharp vinaigrette. And the marrow? Melted in my mouth faster than any M&M I’ve ever had. Basking in the deliciousness of my first two courses, the Agnolotti in Brodo was served. This dish comes from the Night Before a New Year menu. Dishes concocted for this meal are both elaborate and laborious, as what would be expected on New Year’s Eve. I enjoyed this dish and could taste the amount of effort that went into crafting each piece of pasta. 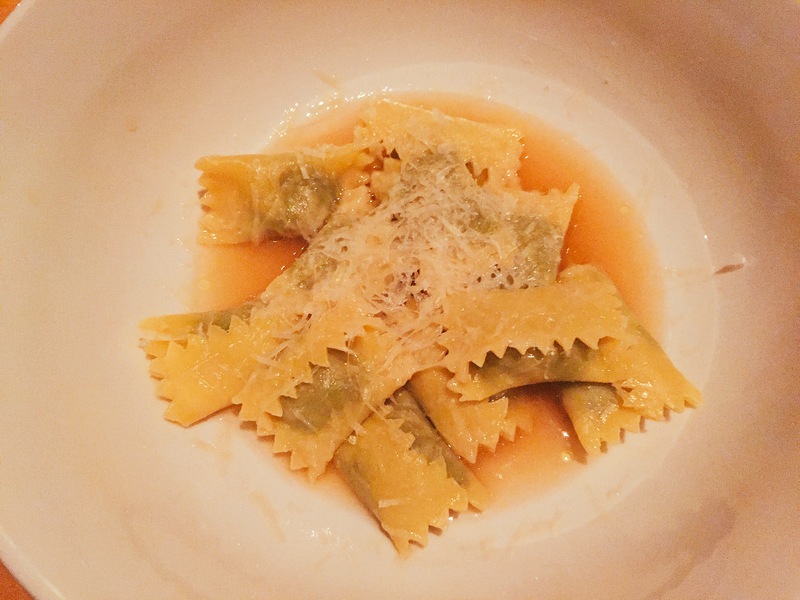 The agnolotti was stuffed with a crumbled pork mixture, lighted covered in brodo and topped with Parmigiano-Reggiano. Confession: If I weren’t in public, I totally would have had every drop of that brodo. AMAZING! 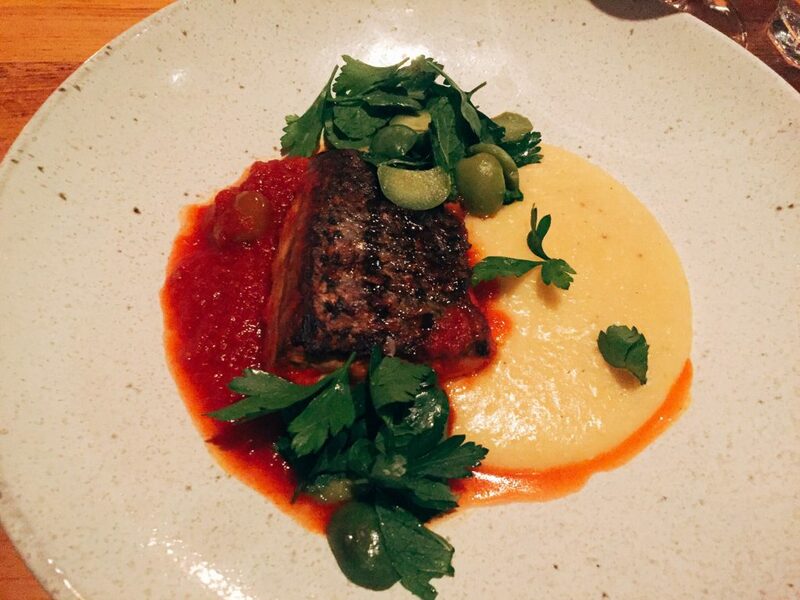 Wild Striped Bass with Polenta, Tomato and Mint highlighted in the Agro Dolce menu strives to find the balance between sweet and savory. The bass was placed atop a soft, creamy bed of polenta drizzled with olive oil and garnished with mint. The creaminess of the polenta played very well with the acidity of the fish. Ending the meal on a sweet note, we ordered Toasted Rice Ice Cream with Bitter Chocolate. I could not think of a better conclusion to this flavor filled journey. 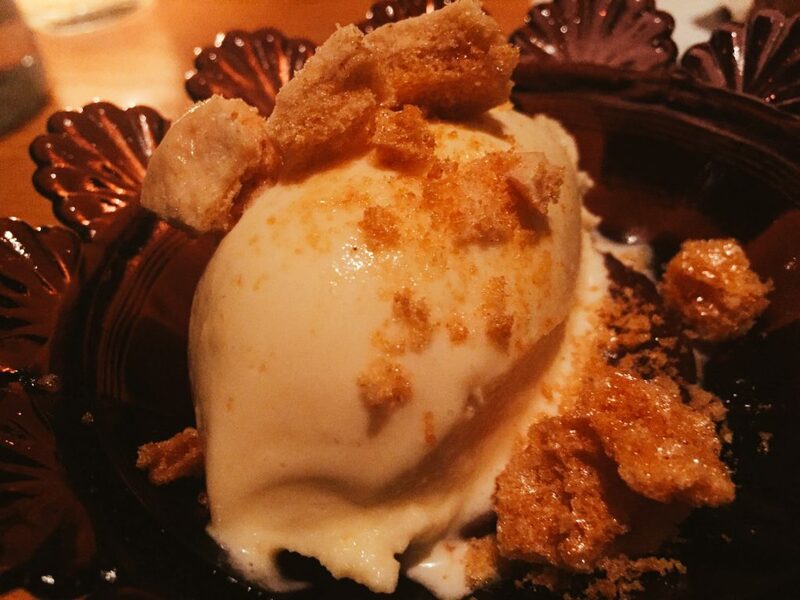 The ice cream was both delicate and sweet, topped with crisps that provided that extra crunch with each bite. Maybe one of the best ice creams I’ve ever had. And yes, I realize what a strong statement that is. Pour yourself a glass of wine and have a seat at Andrew Tarlow’s table. He truly is a hero and an innovator when it comes to American cuisine. I promise you won’t be disappointed.